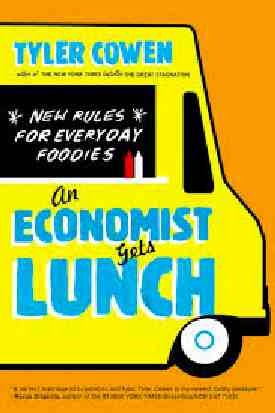 I just finished reading Tyler Cowen’s opus, An Economist Gets Lunch. I have to admit I’m already a fan of his writing, getting a daily dose on from his blog Marginal Revolution. What I like about this book is that it is unconventional by definition. Further economists like scalability engineers like to think about efficiency. How can I squeeze out more from less? Like the business question how do I get better ROI or more bang for my buck? Questions spring to mind like – What does an economist know about food? Or – What does food eating have to do with economics? Well on both points you’ll get some surprising answers. Hiring or job seeking? Check out our MySQL DBA Interview questions which is useful to managers, candidates and human resources alike. Food is a product of economic supply and demand, so try to figure out where the supplies are fresh, the suppliers are creative and the demanders are informed. When it comes to relieving climate change problems, there are two approaches. The first to put it squarely is to have everyone memorize facts about boats & bananas, and update that analysis as often as is necessary. The second approach is to rely on the price system, specifically to modify prices so that they reflect more information about the value of the environment. That’s the economically smart way to address climate change. The first method is wielding a pea shooter and the second is more like a bazooka. Interested in web speed? Why generalists are better at scaling the web. What he advocates more specifically is taxing the things we want to reduce. Biggest on the list are fossil fuels he says and next up meat production which through methane emissions contribute to climate change problems. These taxes will naturally curb our use, cause us to take fewer trips, be more efficient with our use, and tighten the wallet naturally. Applying an economists eye to food & environment yields some excellent insights. For those of us in the startups & internet these fresh takes may well give us some insight in business too. If nothing else it’ll help us find the best meal for dinner!